I don’t believe it! Another debut Listener setter, although Jaques has set 20+ EV and Magpie puzzles over the last few years. 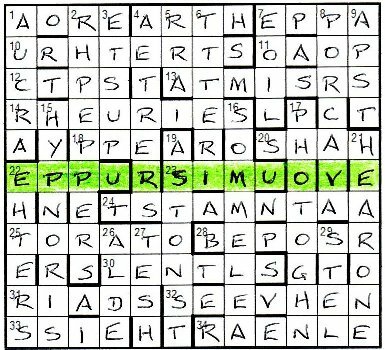 In Body of Evidence, we have a Letters Latent puzzle with the omitted letters spelling out an inconclusive title, and then, a lot of letters need moving in the finished grid. I guess it’s obvious here that solvers are advised to use a pencil, although that bit of advice was last specifically given back in September last year. So, pencil sharpened and off we go. As you may have come to expect by now, my first pass through the clues resulted in a fairly puny harvest. I don’t know how much more difficult LL clues are than normal (or indeed where misprints, extra letters in wordplay, etc all fit in the difficulty hierarchy) … that’s for another day, or indeed an OU thesis! Anyway, getting 15dn HYPNOTIS[M], 19dn ASTON[I]SH and 22dn AE[T]HERS in my first run through enabled steady progress to be made from west to east. 18ac Perhaps object of religious support at Celtic Park abbreviated degree course (3) led to PPE, although I sloppily thought that an O was missing, rather than an A. (As an aside, I know that Rangers and Celtic football teams are religiously divided, but I haven’t found an easy way to remember which is which … is Rangers Roman or Celtic Catholic?) Because of this slip, it took some time for me to recognise Galileo Galilei in the omitted letters; this was compounded by the fact that I wasn’t expecting the author to be in the title. I suppose my favourite clue had to be 12ac Noises emanating from ancient cabinet, maybe chief private secretary which led to CH[EE]PS, and needed us to look up cabinet in Chambers to find that it can mean a bird’s nest. Also up there were 33ac Musical or stage show investigating ABBA’s origins ([O]SSIA) and 22dn More than one means of light transport? Customise hearse (AE[T]HERS). Finally, I had Galileo Galilei Dialogo dei Massimi Sistemi spelt out by the latent letters, referring to Galileo’s book comparing the Copernican and Ptolemaic theories of the solar system. And now it was time to move a considerable body of letters to reveal the evident truth. I looked up Galileo in my copy of the ODQ and found Eppur si muove. But it does move. Since the ODQ wasn’t mentioned in the preamble, I checked the back of Chambers to make sure it was there as well. Across the middle of the diagram was appur si muova with an E below the first A and above the last A. So did they just swap round? Unlikely. Letting my eye roam across the grid, I eventually spotted HEART in the first and last columns, and ten seconds later, all the Hs, Es, As, Rs and Ts around the grid. Of course, they were Es, As, Rs, Ts and Hs. So, the entire circle of EARTHs needed to be rotated to align the first and last Es correctly, and represent the earth going around the sun. Indeed, the EARTHs formed an ellipse, and even the S was there slightly offset from the centre of the diagram to show the sun at one of the foci … or was that just coincidence? A quick bit of highlighting and the job was done. Just over three hours for the grid and endgame, so not too tricky, but thoroughly enjoyable. I, for one, am looking forward to more from Jaques. This entry was posted on 7 October 2011 at 4:00 pm	and is filed under Solving Blogs. You can follow any responses to this entry through the RSS 2.0 feed. You can leave a response, or trackback from your own site. Actually, Dave, Galileo disagreed profoundly with Kepler and insisted the earth followed a circular orbit round the sun. Placing the sun at one focus is wrong for a Galileo-themed puzzle, however accurate in real life. So you’re nearer the mark thematically, whatever the official answer says. Phi, thanks for the correction … and let nobody say that LWO doesn’t welcome harrumphing.